Adrian Lam may have sparked a Super League-wide debate by declaring Wigan's back-five as the best in the competition. They were at their free-scoring best today, racking up five of the Warriors' seven tries in a 42-0 mauling of Catalans at the DW Stadium. Joe Burgess backed up an impressive return a week ago with a sizzling hat-trick, Oliver Gildart went over from 80m and then Zak Hardaker added his first try for the club. With Dom Manfredi and Dan Sarginson also impressive, Lam lavished praise on his backs. "The back five, I think, are the best in the competition at the moment," he said. "I know that's a big statement but Joe Burgess coming back has made a massive difference to the team. "Zak Hardaker has lost about 6kg since the start of the season and that's part of the reason why he's performing better. What I like is that he's taken a leadership role and driving it - I think he's still got 30 or 40 per cent to go." 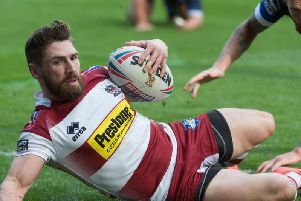 Wigan head to Castleford on Friday and Lam hopes to have Joe Greenwood and Taulima Tautai (suspension) available for selection, while Sean O'Loughlin (hamstring) and Gabe Hamlin (illness) may return.